HRT has moved its racing team into a warehouse in the western industrial suburbs of the city of Valencia, Spain, having failed to get the local government to provide it with one of the old America’s Cup bases in the harbour area. 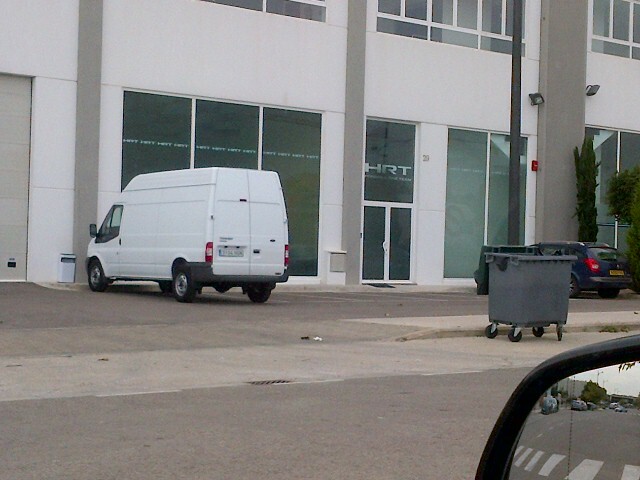 It seems that the new workshop will be used as the team base in 2012, although it is not yet clear how HRT is going to have two cars built in the facility by the start of the new season. We have heard rumours in recent days that suggest that the team management has now realized that there are problems and is now trying to get permission to run its 2011 cars for at least some of the races. This is not as easy as it sounds. Modern F1 cars need replacement parts after a certain period of “life” and the 2011 cars were designed to end the season with the life of the parts used up. Thus a lot of parts need to be replaced. This means that the team’s sub-contractors need to build new old parts, but if they do that the progress of the 2012 car will be further delayed. And finding alternative suppliers at this time of year is going to be difficult as specialist suppliers are already working flat out to supply their F1 customers in the run-up to the new season and, in any case, there are not many companies in Spain that can produce parts of the right quality levels to be used in F1. While it makes no sense at all to give new old parts priority over new parts, it seems that this is essential because the team has now reached a point at which it is too late to have the new cars finished in time for the new season and so the only option is to use the older chassis and to make new parts because they cannot safely run cars with parts that have gone beyond their projected lifing limits. One hopes that the stories of such troubles are unfounded, but given the team’s unrealistic approach to decision-making thus far, it is entirely possible to see how this might have occurred. Can you confirm or deny reports that we can see the 2012 HRT car in that picture? Hopefully for them it’s the Laguna estate, but I’m not discounting the wheelie bin. That blue Laguna is actually a camouflaged 2012 chassis, to be transported to the races in the white van. Catering and hospitality will be available from the pictured dust bin. I hope I’m wrong. I assume that the van in the picture is the 2012 car? Joe, there is a very interesting article from La Libre Belgique (Belgian newspaper) interwiewing Jacky Eeckelaert. It’s in French but, I’m sure that shouldn’t be a problem for the majority of your readers. on January 11, 2012 at 4:33 pm | Reply Stinkfoot. Joe do you think they will be given dispensation to run the old chassis, and how much goodwill is felt towards the team from other concerned parties? More significantly, even if they could pull off reviving their 2011 contenders, those cars would not comply with 2012 regulations, and therefore, would not pass scrutineering. Oh man, this has just got disaster written all over it. Will they be able to do any testing at all before Melbourne? After two dire seasons, surely the prospect of another one will have employees (and investors) jumping off this sinking ship. I remember seeing a nice and empty warehouse shown by a would be F1 entrant at the same time of the year in 2010! Wasn’t the last notion before this news, that HRT had decided to move their base into Madrid. Messy. Maybe Kolles will be back to help the team out sooner than expected? Or would he rather stay away from it not to get pulled down in even more mess with this team? Are the epsilon Euskadi facilities still operational, or are they completely dismantled following the bankrupcy. And I would guess just about everyone would be contracted to building parts for F1 cars, GP2/GP3 cars. Tourincar parts, Sportscar parts, … by now, as you write. Were they not already running last years tub in 2011 just modified to meet the crash test? its a shame to think we could have had either Prodrive & Lola competing at a competent level in place of HRT, the real loosers are the fans, thanks Max. They could have had some arches and a lockup ’round here. Its not quite the McLaren Technology Centre… Do you think their plan is to just survive long enough for one of the car manufacturers to buy them, or have those days gone now? They’d probably be better off just running the white van, as shown in the picture. It would make them seem a lot more credible. Seriously though Joe,what are your thoughts, that given they don’t appear able to make the start of the season, that they’ll still be with us by the end of it ? My cat could run that team better. From all angles, be it basic corporate governance or even just strategising until tomorrow midday, the personnel in this team appear to have some steep personal mountains to climb ! You go through life looking at people like that and when you’re younger you thnk – – – -wow, they must be clever guys, to hold those positions. Then as you get older you realise that about 90% of them are either chancing bulls- – – – – -s or they’ve just lucked in. it’s the drivers I feel sorry for. I think Bernie should now throw HRT out on the grounds that they are very very stupid people who will inevitably show themselves up and by extension F1. I mean for crying out loud, I’m an F1 team boss but er…..I don’t have a car. C- – – – t alive! Well, I mean, I’ve only had all year to organise it. It’d be funny if it wasn’t so tragic. A bloody warehouse !! (Ah, but only because we couldn’t get into the YACHT BASIN ! What is this, party night in dumb town. Hope Pedro likes hopes sailing. Have I got to be the one to say it? Basically they are stuffed!! Just open a rave venue in the warehouse instead it will make money. I think we can see their 2012 chassis in the pic: four wheels, a hinged lid and enough space inside to pop a race driver in. Didn’t they effectively run their 2010 car last year? Which means they’d be running round in a car designed over 2 years ago. How bad must Virgin be, being beaten by these guys for the last two years? What? Are you saying that this is this not the text book way to run a team? I had heard that Ron Dennis was seriously considering remodelling Mclaren in the HRT mould. It’s not just the crash tests, their tub is out of regulations for 2012, because some of the dimensions changed, most importantly the maximum hight at the front bulkhead of the monocoque. As this is not changeable without building a new monocoque, and their old one can not pass scrutineering, the whole idea of running HRT’s old cars for 2012 is simply not feasible. Stone me! Total lunacy doesn’t begin to cover it. Can their registration be thrown out Joe? with a name like HRT what do u expect ?? more than from those with a name like BRP and the same that those with a name like BRM ? Seems like Jaime A made the right choice to not get involved… BTW, any news on the breaking Kubica story??? You have to hand it to HRT, however. They ginned up an F1 team and somehow managed to obtain an entry where others failed. It may not be pretty, and it certainly hasn’t been fast, but they’re on the grid. Is that a contraction of are or were? Erm Joe do they even own the 2011 chassis? As it was developed by Kolles they could possibly have no car as they passed him along. Also interestingly Chandok made a comment in Autosports end of year review podcast that the underlying chassis is the same as the 2010 (he reckoned – but im not sure how much of it was a cheeky dig). To dallara again maybe? Even though the team split from Dallara mid-way through the 2010 season. The rubbish tip says it all. In fact, the Spanish team has said it still working to put their new car on track for the first time at the Circuit de Catalunya, in the pre-season test to be held between 21 and 24 February. They are also evaluating the possibility of advancing a little time to even the Jerez test. What they say and what will happen are two different things. They have said a lot in the past. My view is that we will see when the season kicks off what is true and what is false. I am reporting what I heard. The team has chosen a new way of doing things that it seems much better in the long-term.Only need a little bit of time to prove they are on the right path. They have beaten Virgin the last two seasons with less money…so less jokes, they have earned their respect. The worry is also that they’re showing no signs of become more stable, more structured and then more competitive. The split with Kolles can be seen as no more significant than Virgin’s (now Marussia) split with Nick Worth, but in terms of sponsorship and management Marussia look like building slowly but surely. The impression of HRT, however, is constantly fire-fighting and jumping from one panic to another. I’d love to see Hispania settle down and become a worthy part of the F1 grid (I think all F1 fans would), even if they remain back markers. But the truth is that the desperate rush to be ready in 2011 and 2010 made them a liability in the first couple of races. Goodness, you are Spanish. What a surprise. but if the key factor is from what country we are…you shouldn’t write about any british team, any british driver…should be? we don’t think that by being born in Spain have to support mandatory…we have our personal preferences. We are not French nor British defending our people :P…wait!…maybe are there people in England who doesn’t like Lewis Hamilton? XD…I don’t know, but in Spain there are people that doesn’t like Alonso…not in my case, but there are…so we may be somewhat more objective, maybe? What a lot of crap this is. Kindly write something useful and constructive or stop leaving comments. Logan, mayn problems many poeple have. Their treatment of drivers is the worst of all the teams. They haven’t designed their own chassis yet, their HQ is temporary aparently isn’t set up, they have no money yet chose to move around and spend it on useless things like new HQ, large numbers of their small staff have left with Kolles. They haven’t done anything except make bad decisions. Ontop of that they are yet to do a single metre of testing, let alone design a chassis that was made this side of 2009/2010! they have chosen not to renew with Kolles and own their own destiny by hiring people for themselves…that’s the problem with Joe, who in the past said that without Kolles, HRT couldn’t exist. They want to do a better job, because with Kolles, they have spent a lot of money paying for the services provided by him.They think that their own way of doing it is much more efficient, because then the money is spent better. There will be a HRT team in two years fighting for more important things, trying to beat Caterham and the established teams.That’s the plan by Thesan.They thought that with Kolles it wouldn´t be possible. When Force India fired up Kolles, the team went from 0 points in 2008 to 69 points in 2011.If they wanted to grow, they have to be masters of their own destiny.Kolles was the person required for the journey in the last two season. Now it’s another stage and it’s required another kind of person…that’s all. I think you have made the point about what you feel. The answer is the same. We will see. IO think it will be a disaster. Well they are at least paying their rent on the lockup as the wheelie-bin appears to have been recently emptied. incredible, team HRT are not F1 worthy!! Joe, perhaps my understanding of “Car” isnt what it should be with F1, but Im assuming you mean the car is the chassis right? Well, wasnt the 2011 chassis just the 2010 one? You dont mean to say that it will go around again for the 3rd time? Wow… unfortunate for HRT. But I have re-occuring dreams of a U.S. Constructor coming into the picture soon(ish). I feel like F1 will need an American constructor in order to acheive the sort of success they ‘should’ be seeking here in the U.S.. Maybe by the time HRT throws in the towel… someone in the States will have stepped up to the plate. I love F1 without question, but my fellow Americans have no national pride to rally behind. That needs to change… and if it does… it will be glorious. Thoughts on this Joe? Or is it far too early to contemplate such outlandish hopes? While I share your wish to see American involvement in F1, my hunch is that it’s several years away at the soonest. Good American racing teams expect to make money, and not-so-good American teams expect to lose money at a much slower rate than F1 involvement implies. Of course I remember USF1… What is your point? What a mess. This is not about money anymore. This is plain mismanagement. Joe, I believe the 2012 car is near completion. And I also believe that this building in Valencia is and was always going to be “temporary” until HRT find a permanent base. LPS: “Right now we are working at a provisional base in Valencia until the location of the permanent headquarters is defined. There a few strong options but nothing is closed yet. Once everything is sealed we will make it official”. No. The season begins and all can see that the worst prophecies were actually factual so nothing more need be said, or writ. I think they’d be better off racing the wheelbin! Aren’t their 2011 tubs(safety cells) from the 2010 cars already, atleast it was so at the beginning on 2011… surely they have reached the safe operating age or is that not governed by FIA ? They need John Cleese and Connie Booth. I reckon that they could fit a couple of karts in the back of the van; not sure about two F1 cars + spares. I don’t even think that you could rely on them to field an entry in the local kart races…. Joe, when you say ‘run the 2011 car’ you mean the same car that started its life around the start of the 2010 season? From memory, and the bit of checking I just did, the 2011 car was just an upgrade on the 2010 model not even an ‘evolution’ as Newey calls it. So 3 seasons without testing, 3 seasons without big improvements.. I really believe this is untrue, sorry. HRT will live through this and have their car ready. I also believe they will beat Marussia third time in a row. We will see. I hope so. F1 needs good teams but the signs are not good. I love how in that f1aldia article where they talk about your reporting, they say Joe Saward, the Briton…. like that is some how relevant to what they are saying. Seems like they are trying to stir up the Spanish. They should have said the Briton who has lived in Europe for the last 20 years. But hey they see things in nationalistic black and white. That is their way. I’m really not bothered. Hi Joe, you say that have lived in Europe for 20 years, so yo do not really think of the UK as Europe… I really enjoy reading your opinions on F1, because you definitely have opinions, but I do not agree with the way you are dealing with these news about HRT team. PDLR, Luis Pérez Sala, Toni Cuquerella deserve more credit than the one you give them. Anyway, thanks for your commitment to F1 and just wanted to say that nacionalism has nothing to do with the F1, or has it?…Make your choice, but please do not trash talk about politics in your blog. Make my choice? What a lot of rubbish. I have simply reported stories that are circulating in F1 circles. To be attacked for reporting what might happen because it is deemed anti-Spanish is not acceptable. It has got nothing to do with Spain, although the ever-so sensitive nationalistic types cannot see beyond that. Time will tell what these people deserve – and they will get they deserve. I have simply pointed out that they are taking a perilous path and that no-one in F1 (without a vested interest) thinks that they are doing the right thing. Ultimately I don’t care if they succeed or fail. I think that they will end up following the path of Campos, Carabante and Epsilon Euskadi. Talking a good game is easy. Delivering is another matter. Yes Joe, we will see. But since Carabante has been thrown out the team has taken a more serious and professional approach. As you say, they’ve said a lot in the past that ended up being rubbish, in the Carabante era. In the Thesan Capital era they have not bulls****ed once. People talk about Colin Kolles on here as if he were some kind of Messiah, when really he was a thief that the team had to get rid of to go forwards. Time will tell, but if they do seem to get things right, I really do hope all these people slating them (without any real information on the topic) are manly enough to rectify and give credit where credit is due. Luis Perez-Sala is not a rookie in motorsport…and Toni Cuquerella, and Angel Baena, and Jacky Eeckelaert, and Pedro de la Rosa…they are people very capable that knows a lot about F1. is very naive from your side to believe that decisions are made without knowing what they are doing.Having the headquarters in spain doesnt mean not to be succesfull in the sport.Barwa Addax and Racing Engineering are two of the most successful teams in the GP2 championship, and thery’re based in Spain.Ferrari are based in Italy (Maranello), Sauber in Switzerland (Hinwill), Toro Rosso in Italy (Faenza)…There isn’t a single path / way to be successful. Time will tell, but util then, stop the rubbish!.The team doesn’t deserve it.They have done a great job last year. If you read the blog thoroughly you would know that I have known – and written about – Perez Sala since he was in Formula 3. The same is true of Jacky E. De la Rosa is a new boy is comparison to these guys and Toni Cuquerella and Angel Baena are still new enough for most of the F1 circus to say “Who?” when the names are mentioned. GP2 is a completely different story to F1 and anyone who really knows the sport would not try to justify the argument using them as examples. Similarly the argument that being outside F1’s Silicon Valley is a good idea is naive. Ferrari is there because it has been there for 60 years. Sauber has been in Switzerland for 30 years and Toro Rosso is Minardi by any other name. They exist in these places for historical reasons not because it is more efficient. Do feel free to be rude about my comments after the team has turned up in Melbourne with two new 2012 cars, as originally planned by the old management. I have been around long enough to have seen cases of F1 teams where delusional nationalists have turned up with old cars featuring out-of-life parts, which are a danger to the drivers, and to those around on them on a race track. I do not wish to ever see that again. Saying things like De la Rosa is a new boy is joking, isn’t it? The step taken by thesan has their own risks, I know, but is the only way to make progress. In Spain we used to say: “one step back, two steps forward”, so that’s the idea with HRT and Thesan. what you can’t say is “they are wrong” without waiting to see the results of their strategy first.In the end of 2012 season, we talk again. I have made it very clear what I think. You can argue whatever you wish, but I have seen many teams come and go and I have some idea of how things are done. All I trying to do is to save them the pain, but if it is pain they want then they are going in the right direction. If the team is a disaster in 2012 I doubt I will ever hear from you again. To those pointlessly arguing with this post: The failure of numerous F1 attempts over the history of the sport has brought to light a number of classic errors that subsequently proved to be decisive in their downfall. Unlike most of us reading this blog and a number of people involved in the sport, Joe is someone who’s been around long enough to spot them. And being a journalist and blogger, he’s merely reporting what he’s found. I can’t see why that is so hard for some to grasp. Hear hear. If you’ve read/listened to Joe elsewhere, you’ll know that he’s not anti-HRT and he probably knows a damn sight more about the what goes on inside the F1 industry than 99% of the commenters on here. Which is the reason I come here. They should not have got rid of Kolles, at least not yet. Keep him for another season and build in the background, so when they did split, HRT would have some structure to fall back on. Instead, Kolles took pretty much everything with him, and HRT are again starting from scratch, only this time, there’s no one driving them forward. They’ll miss testing, that’s for certain in my book, and they’ll be lucky to be on the grid in Aus. Yea I agree they should have prepared the infastructure so that staff and facilities would be there and ready to develop before splitting from Kolles and his company. I doubt the FIA would ever allow them to use the F111 for several races, so if they can’t complete the F112 I believe we way not see them in the sport any longer. Personally I prefer more teams than less, but I want to see each team progressing and currently HRT don’t seem to be. Marussia (Virgin) may have been behind them in the standings, but at least they appear to be making progress through this last year towards their 2012 contender (after Wirth’s CFD approch didn’t bring performance in 10-11). HRT is a young team and I ask Mclaren was created in 2 years? I am very happy for Spain to have an F1 team. But if they want a successful they must have the intelligence to do it in a sensible way. This is not the way. OK, if they wish to go ahead then they will spend more money and it will take them longer to be successful. Do they have the money and the patience for that? I doubt it. These are not passionate racing people. These are bankers, looking to make a profit. And where is the money in Spain these days? I am sorry, Joe, but I cannot feel any kind of discrimination or unpoliteness in introducing a person by its nacionality, and it is quite common by spanish journalists. Well, in Catalunya,journalists have developed an even more precise introduction by calling the region where the person was born! I think this national nonesense is mainly led by bad politicians and bad journalists, and since I am not in any of this groups I cannot care less about it. As a F1 fan I would like to see a full grid with competitive cars. But since there will always be mid fielders and back markers, as long as everyone is fully involved in the sport/business there will always be praised teams. Minardi, Tyrrell, Arrows, Sauber,… all this teams were small, at least during the past 20 years. Sometimes they chose the wrong path, and yet they were the essence of what I understand as F1 team. My feeling about the former Hispania was of a great shame. It was a similar feeling as the one I had with Jaguar, for instance, because I felt that the people behind the project were given a great chance, but they wasted it. Hispania owned a entry, but the cars were carried by someone in germany that was not Hispania. Someone who was extremely efficient and had the know how, yes, but as someone has pointed out before, this is the way of leading a GP2 like team, not a F1 team. Fans do not want this. Hispania was bought about six months ago, and now some different people are ruling it. HRT might be struggling to keep themselves in F1. They might finally sink like a stone, but if they do and they fight until the very last moment I think they will increase the F1 legend. Like Lola did in ’97, or like most of the disapeared teams of the beginning of the nineties. They will remind us that F1 is not for anybody. Both Hispania and Virgin have been in two F1 seasons, but they have yet to show to the fans that they are true F1 teams, like Caterham has. The F111 was the 2010 car rehashed. If the Carabantes had had any brains they would have sold the entry. Instead they lost it all to the bank. Kolles was not fired. He left with the agreement of the owners because he wanted nothing to do with their ridiculous plan to move the team to Spain. Just because you can read websites does not mean you have any idea what is going in behind the news. We will see what happens, but I stand by my belief that they are a bunch of people with no idea what they are doing. And I think you also need to check who is still working there. The above comment is is one of string of comments that come from someone in Madrid. I have the IP addresses so I know the region. I believe that this person is writing comments with a number of different names and I believe he is employed as a marketing consultant by HRT, his role being to put out positive propaganda about the team – and attack anyone who questions what they are doing. If these people want to play such games then I am eventually going to find out the name of the person in question ( I have it already but need to prove the connections) and if I do I will publish it, simply because the commenter is behaving in a fraudulent fashion and pretending to be a reader when in fact he is a propagandist. He is attacking my credibility and thus I have no qualms about exposing him as a fraud. If he then loses his job, it is his problem. I am not publishing any more of these comments because it is obvious what is happening. Unfortunately, some (not all of them) don’t even know how to behave on the net, but that’s not HRT’s fault. Be that as it may, I am 100 percent certain that there is manipulation going on, probably on Pedro’s forum as much as on my blog. Hehe, I’m not surprised, I suspected as much some posts ago, he got just a bit too unsubtle with his plugging at one point! More power to your elbow, as always. Spain wouldn´t have the “technology”,?? ?I´m going to point out just FOUR of many other Spanish Technolgical knowhow “I´M NOT DOING IT TO ANNOY ANYONE AT ALL JUST WANT TO POINT OUT SOMETHING MANY PEOPLE DON¨T KNOW..
ASCOD..-Austrian Spanish Cooperation and Development (light armoured vehicle Ulan-Pizarro),,started as prototype in 1992 went into production in 1996 in Spain and is also in service in Austria,,IN 2015 WILL BE IN SERVICE IN THE BRITISH ARMY…. Norway has TWO FRIGATES ;-Fridtjof Nansen(F130) and Thor Heyerdahi(F314) MANUFACTURED BY NAVANTIA IN SPAIN. HTMS Chakri Naruebet 991(Aircraft Carrier) MANUFACTURED by NAVANTIA in SPAIN for Thailand´s NAvy.. I COULD CARRY ON FOR EVER ON THIS ISSUE….. Does this relate to motor racing in any way. The point isn’t that Spain is somehow a technologically backward country. The point IS however, that F1, like a lot of highly specialised industries, is a place of very specific expertise. I presume you object to this phrase from the original article: “there are not many companies in Spain that can produce parts of the right quality levels to be used in F1” – and to some, minor extent, you’re justified in asking for a citation. Joe’s point is that behind the scenes, many F1 parts are not made by the teams (designed by is different) but are instead made by specialist constructors with the expertise and equipment to produce some of the most finely crafted components on the planet. This level of expertise is very rare and cannot be learned overnight. In and around F1’s “Silicon Valley” in central/southern England, there are a lot of racing teams and therefore a lot of these highly skilled suppliers. It’s a symbiotic relationship, they’re there because the F1 teams (their customers) are there, the F1 teams are there because there is such a cluster of possible suppliers. Spain, whilst it does have a few successful race teams and plenty of other successful engineering projects, does not have this sort of concentrated centre of F1 expertise. This isn’t to say that running a team in Spain is impossible. If it were, it would surely be just as bad for Sauber and Minardi/Toro Rosso to be where they are. But it is fair to say that it won’t be as easy for them in Spain as it would in the middle of England. I took a look at the HRT website the other day and they’re recruiting engineers with a few years of F1 experience. But they’re advertising entirely in Spanish for positions in Valencia – which pretty much rules out anyone who’s not Spanish or south American because outside those regions, no-one is really learning engineering & Spanish at university. In the UK and US, we don’t bother with learning a second language and everywhere else, that second language is definitely English. I’ll be interested to see how long those roles remain listed as open on the website. And should probably go and get my eyes tested. HRT design is based in Munich, the logistics in Spain, all the F1 teams has two point the logistics and design. I mean they give you money sports look the business side takes people who know about F1 and experienced and you know HRT engineers are very good now remains is to get sponsors and grow the team. Half of what you have written is not true, but I am sure you know best. Joe isn’t anti HRT like someone said some lines before, that’s right. But also is right to tell that he is completely PRO Liuzzi and we all know what will happen with Liuzzi in HRT. The rest is your own imagination, pure cause-effect i think… quite clear. As you do not have the balls to put your real name and email address on this brainless remark, I will have to reply to you publicly, rather than sending you a private message telling you what to stick and where to stick it. All I know is that the message came from a Spanish IP address and that is no great surprise because all-too-often Spanish commenters react badly to anything that even vaguely questions Spain. Why do so many Spanish fans personalise and nationalise their comments? I am not attacking Spain, I am simply pointing out that the majority of the F1 circus believes that Thesan/HRT is bound for disaster, just as Adrian Campos was and the Carabnates. When I first met the Thesan people I thought they had some idea what they were doing and would listen to sense, but they have embarked on a project which makes no sense at all in F1 terms. It is as simple as that. It is not just me saying that. It is most of the F1 paddock. It has nothing to do with Tonio Liuzzi. If HRT does not want Tonio then that is fine, so long as they treat him properly when it comes to compensation. I gave Force India a kicking because they did not treat him fairly. In the end they did pay him but I do not like to see teams screwing people around like that and so I spoke out. My view is that Tonio is probably better off out of the team in its current form. I feel sorry for him because I believe that a major talent has been wasted. I am not the only one with that view, indeed that Spanish icon Fernando Alonso has said as much himself. So my reportage about HRT is based not only nationalism, but rather on logic. As I have said before we will see what happens with HRT, but I guess aaa and other critics will not fess up and say “We were wrong” if I am proved to have been right. People like that never do. Can I mention just how disturbing and off-putting this nationalistic element is to me? Formula One isn’t a war of nations, it’s a competition between teams. Teams made up of the best personnel their financiers can afford, regardless of their place of birth or chosen citizenship. If Thesan/HRT elect to limit their choice of employees to just Spaniards, logic would dictate that they will likely suffer worse performance compared to a team with the same resources and a wide-open choice of employee background. Maybe their gambit will pay off, and they can garner more financial support from Spain through their Spiel, and gain competitiveness overall, but how likely is that, given the current economical situation and general market size of Spain? And what will happen when the day comes, and the bankers want out? Will HRT be stuck finding their next suitor only in Spain because of their current portrayal as a Spanish team? I’m with Joe on this, because the downside of this PR campaign seem much larger, and much more likely to occur, than success Thesan seems to base its strategy on. We all get hot under the collar some times but some of the comments on this post and others I might add , are just plain rude. I thorougly enjoy reading this blog on the basis that it is written by somone whose writing I have enjoyed and respected for many years and who , i suspect , has forgotten more about F1 than the majority of us will ever learn. Joe has the right to his opinions and views , as we all do but do bear in mind thist is HIS blog and we all have the choice to read it or not. If you disagree with what he says fine but have the courtesy to be polite about it and don’t ruin it for everyone else. There we are. Rant over ! Am I right is saying the F111 tub wouldn’t meet the 2012 regs, so a rehash of it for 2012 would work using common sense? First, IMO this thread is a testament to Joe’s willingness to publish views which differ from his own, and to do so regardless of how rudely they are stated. I have no way to know which opinions he refuses to publish, but we all can see with our eyes the range of opinion he does publish. FWIW (which I’m sure isn’t much), I can warrant that his patience is considerably greater than my own. 1. Whether or not recent decisions by HRT appear to have been poorly informed and naively implemented to such a degree that it calls the judgment of their decision-makers into serious doubt. 2. Whether criticism of HRT’s decisions imply that the person doing the criticizing believes that Spain cannot or should not have its own home-based F1 team. Joe’s comments on this topic have been focused on #1 while those who are emotionally involved in denying the legitimacy of Joe’s views have introduced #2 and then proceeded to be rude about an issue which they themselves have fabricated. While I agree with a previous poster that only the future will tell us with any certainty what the outcome will be, I was surprised to read that Joe should refrain from offering critical opinions of HRT’s decisions until after racing has demonstrated the outcomes. This is equivalent to ordering others to not voice opinions which that poster does not like. My personal view is that we don’t need to see any checkered flags before we can see results. Rather, if we see HRT trying to enter car that is basically a 2010 version with updated parts and a fresh coat of paint, that simple fact will confirm that the outfit is being led by folks who don’t know what the hell they’re doing. For them to have immediate relocation to Spain as a higher priority than having an actual 2012 racing car pretty much tells us what we need to know. Now, if they had focused on the racing part first, and then planned a proper relocation of facilities later, one might think they have a clue about what they’re doing. But that appears to be rather different than what they have chosen to do. There is another element that must be included. In some cases there are people who are pretending to be fans but are actually employed by teams in order to put propaganda out on to the Web, and to attack critics. They are actually marketing people, rather than fans. They attack sources that do not fit in with what the team wants the world to know. I think these people are frauds (just as most of those who call themselves F1 experts are also frauds) and I will expose them as and when I can prove they are doing this. These people need to be debunk and discredited because they are propagandists and misleading real fans. I rather feel some sympathy for HRT, and Joe may not have been so kind to Thesan’s approach, but if he was sent this picture, that means he still has some insider source. And I don’t think we should forget nationalistic approach. Spain is kind of bipolar country, where the “with or without me” is the rule. And that law killed Campos Meta, like it killed Hispania Racing, and it will kill HRT. At least, next months will be more than entertaining, after a too quiet silly season. First, I hate this nationalism on the comments. After all, if Joe is British, and you don’t agree with him don’t read this blog. From 2010, I have been a really loyal HRT fan. Even when I heard that they were not going to participate in 2010 and 2011 pre-season testing I did not abandon my belief that they are good. But I’m decreasing my support now because the team itself has pushed the auto-destruction button when they let the Carabantes take over. Don’t take me wrong, I still support them and believe that one day they will get up and try to develop. I know some don’t agree but I think if Adrian Campos remained or Epsilon Euskadi together they would be better. Don’t think I’m saying they’re bad because they change their website. They don’t have passion. They change their driver every year. They are only their to try and make some profit. You can’t be like that in F1. Money will come later but first performance. Please, Luis before the season begins try to find a F1 manager game online and practice a little bit. Ive read most of the posts and sadly I would say that there there is something personnal, you will be able to judge HRT in a few weeks….not whith a bad looking photo. Well, in that case, I am sorry to say that you have no idea what you are talking about. A I have said several times, we will see what happens. Perhaps you could start a repository of threads called “Bizarro Classics” and include access to that collection as a feature of the annual subscription? How,when and almost one would have to ask”if” private testing sessions were to have a come back,what sort of limitation would they have? Joe, with the 2012 regulations dictating cars must pass crash tests before taking part in pre-season testing do you think anything relevant can be taken from the teams that have already passed the tests and made the information public? I’m not Joe, but being an engineer by trade, my professional opinion is: No, there’s nothing worth reading into it all. 1) Failers will be right on the margin weight-wise. 2) Failers will have heavier cars by over-compensating to get through. 3) Failers will suffer through late changes to chassis design. 4) Passers have better simulation due to more conventional – but possibly heavier? – chassis structures. 6) Passers have done more testing of their own before involving the FIA. Realistically a first time pass is probably better than a first time fail, but the impact should be negligible, especially for the bigger teams. As discussed elsewhere, a car on the limit of the 2011 regulations would not pass 2012 tests. The side-impact test for one has become more strict. “It is not the critic who counts: not the man who points out how the strong man stumbles or where the doer of deeds could have done better. The credit belongs to the man who is actually in the arena, whose face is marred by dust and sweat and blood, who strives valiantly, who errs and comes up short again and again, because there is no effort without error or shortcoming, but who knows the great enthusiasms, the great devotions, who spends himself for a worthy cause; who, at the best, knows, in the end, the triumph of high achievement, and who, at the worst, if he fails, at least he fails while daring greatly, so that his place shall never be with those cold and timid souls who knew neither victory nor defeat. There are 12 teams in F1, 11 of them has a purpose or a reason to be in F1, the one left out which I believe is HRT. I know the new owners want HRT to be a Spanish team, but moving racing team to Spain after couple of season that too without proper or no planning. I think moving the racing team can’t be done within a year or few months. How can a team be sure that all the team members are willing to relocate in Spain. As we can see from above, team doesn’t even have there own facility in Spain. I think all the drivers who missed out on F1 shouldn’t be looking at HRT as a option any more. I think HRT could have been called Spanish team if team stayed in UK and gradually moved to spain that would have worked better.